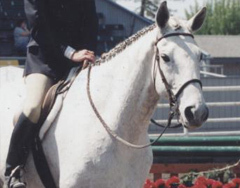 QUESTION: In a hunter under saddle class, comment on the “frame” of the horse you are looking for. Are you looking for a degree of collection? Can a hunter be too strung out? In hunter under saddle classes, the horse’s movement and manners are judged, with quality of movement paramount. Generally, horses are shown at the walk, trot and canter in both directions. Good trainers and riders can accentuate their horses’ movement by creating a more extended, fluid and balanced gait. This gait is established through various means: establishing a certain amount of collection, moving at a faster pace, sometimes a looser rein, and/or using various equipment (bits, etc.) to achieve the desired “frame” or way of going. Our judges comment on the optimum frame and ideal under saddle horse.